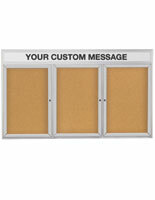 Common Size: 72" x 48"
This cork board incorporates self-healing cork. That renders this bulletin board an perfect cork board for many years of use. 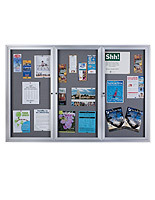 This enclosed bulletin board is engineered solely for indoor use. Four corner mounting holes are located on the rear of this cork board, likewise recognized as a tack board. Professional installation is needed, as is mounting hardware for whatever surface this cork board is put onto. This cork board incorporates (3) lockable doors. 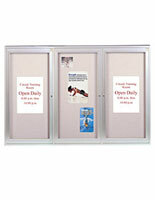 The doors on this tack board, cork board are also shatter resistant, safely guarding your postings. 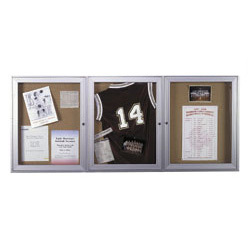 Bulletin boards, tack boards, and other cork boards can be utilized to exhibit the directory of a business, or promote upcoming events in a school. 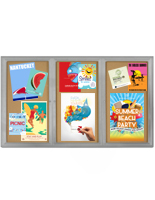 Made of aluminum, this announcement board, cork board looks outstanding in any décor while offering a longstanding frame. 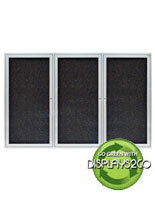 Displays2go partners with Ghent to bring you this deluxe, US manufactured cork board display. Ghent is a superior producer and marketer of American made visual communication products and specialty furniture, since 1976. 72.0" x 48.0" x 2.3"